Antigua and Barbuda has ended 2016 on a high note by celebrating the arrival of the 100,000th US Visitor in the year, for the first time in recorded arrivals history. This milestone is a crowning achievement in a banner year for tourism that included announcing multiple new properties, the re-opening of Pineapple Beach Club, breaking ground on new projects including a Marriott Autograph property, the extension of Heritage Quay Pier that welcomed a Quantum class vessel for the first time, Anthem of the Seas and a variety of awards and achievements including most recently being named ‘Destination of the Year,’ by Caribbean Journal’s 2016 Caribbean Travel Awards. 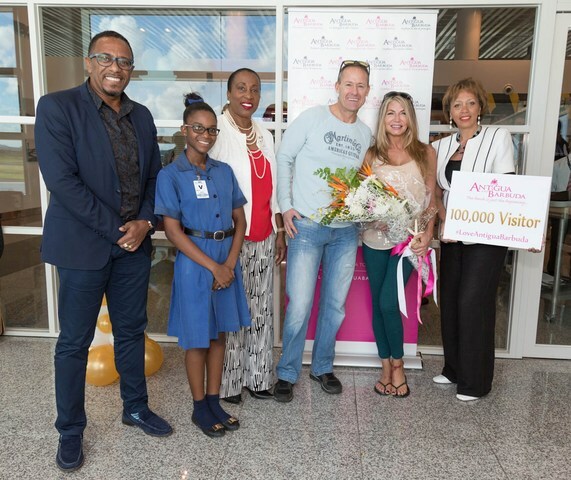 The 100,000th US Visitor was Ms. Jean Larsen, an artist and philanthropist, working with Pink Rock, a breast cancer survivor charity. Ms. Larsen who was traveling with her partner, Greg Murphy on American Airlines flight 978 from New York-JFK to VC Bird International Airport, was greeted by the Minister of Tourism, Economic Development, Investment and Energy, Honorable Asot A. Michael, CEO of the Antigua and Barbuda Tourism Authority, Mr. Colin C. James, Tourism Consultant, Ms. Shirlene Nibbs, US Director of Tourism, Ms. Kim Jack Riley and Tourism Cadet, Alicia Paul, with flowers and prizes. In honor of this milestone, partners Elite Island Resorts and Pineapple Beach Club Antigua, provided the Grand Prize of a complimentary 3-night stay for two at Antigua’s newest all-inclusive resort to Ms. Larsen. She also received a circumnavigation tour for two from Wadadli Cats, and kayak and snorkeling for two from South Coast Horizons. Pineapple Beach Club Antigua is Antigua’s most laid-back, adult’s only resort, located in a tropical hideaway where the beach curves in a perfect quarter-miles arc of brilliant, powdery white sand. The resort offers Caribbean-style accommodations amidst 30 acres of lush gardens, where guests can swim in the resort’s two freshwater pools, enjoy a gamut of non-motorized watersports or dine al fresco at one of the seaside restaurants. All of the passengers on the flight were treated to special music and dancers upon arrival, as well as a gift bag filled with local delicacies and a discount code for island tours to complement their stays. Tourism arrivals from the US have been strong throughout the year, with double-digit growth month over month. According to the latest statistics, at the end of November 2016, arrivals from the US were at an 18.35% year over year increase that is predicted to remain the same or grow once December figures are released. This growth is particularly significant as the US remains Antigua and Barbuda’s largest source market for arrivals. Overall visitor arrivals have also increased by a strong 7.42% year over year as of November with numbers suggesting the year will end on a substantial increase with over 250,000 visitors overall.